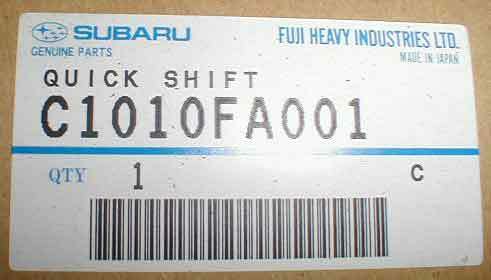 As part of my transmission swap, i was eager to explore the possiblities afforded me by the various short shifters available from a number of domestic and overseas manufacturers. A shortened shifter and stiffer bushings on the linkage make the gear engagement quicker and more accurate than with the relatively sloppy stock setup. Unfortunately, i had some lessons to learn first hand about what fit, what didn't, and why. Read on. After investigating a number of the available packages, i first settled on the Kartboy shiffter after tallking with Tom Deadrick from Kartboy. We measured the width of the section where the bolt connects the top linkage and the shifter rod itself. This is about 20mm, and he said that should match up with the RS. The WRX is much wider, at least 34mm. 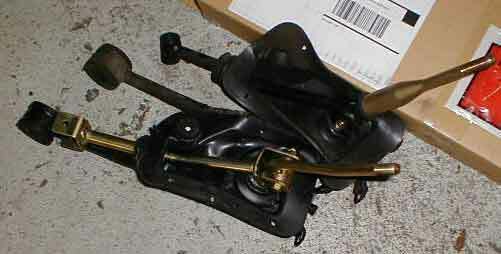 I ordered one of the shifters and the bushings from Tom. Upon receipt, i was sure that it wouldn't fit, so i contacted Tom again. That same connection point was at least 30mm, and there was no way i could get it to go in. Tom realized that he might have shipped me the wrong shifter by accident, so another was shipped to me, with a free T-shirt, to see if it would work. It didn't work, it was the exact same as the first one. I measured again and took pictures to send to Tom. He proclaimed that the shifter was right and that that was the narrowest one he made. I shipped everything back, minus the candy in the package of course, and promptly got a refund. So much for that! 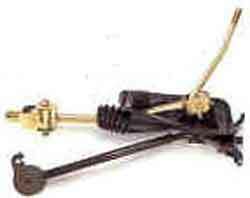 Jason Grahn had recommended the STi/SPT shifter assembly from the word go. He's had it for a while on his 90 sedan, and has been very pleased with it over the stock assembly. I called up Richard Buckner and had him send the one, as he generally keeps a few in stock, and it arrived a few days later. I decided to have Charlie install the shifter, as he's got all the right tools, patience and charges a pittiance for fine work. Unfortunately i was bit by another problem that we discovered at in the 11th hour: the linkage between the top rod and the transmission was different. This meant that the new assembly came out, and the old one went back in. Frustrated, i called Richard and asked "what gives?". Richard remembered an earlier conversation i'd had with him, when i was inquiring about clutch and flywheel possiblities, with the shifter in mind as an addition. Richard mentioned that the shifter kit had previously included the extra parts to make it all work, but STi had since eliminated that part from the package, not reduced the price, and now charged $40 for it. 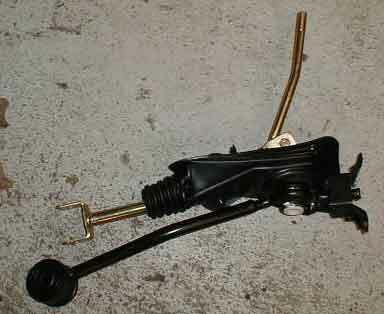 Humbled, i asked him to send me one, plus the shifter return spring, as soon as he could. A few days later it all showed up. Back to Charlies, we did a quick take and made sure that everything should now go on, no problems. They did go on, no problems, but i'm sure glad that Charlie knows what he's doing, as the pin that keeps the linkage on the transmission would have been hell for me, judging by the difficulty he had in both removing and reinstalling it. Money well spent. I'm not discouraging anyone from doing this by themselves in their driveway, but it's not the easiest thing to do! 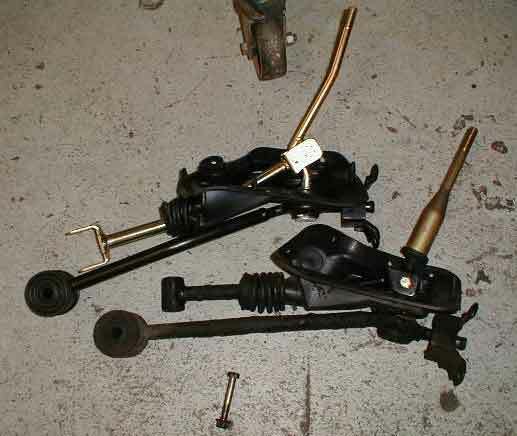 Note that the stock bolts from the original linkages all fit fine with the new one. 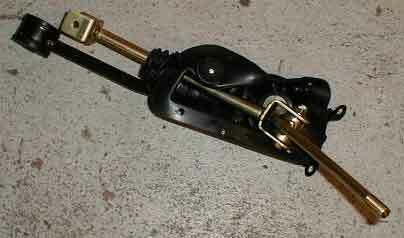 The shifter is now MUCH shorter and very notchy. The relative difference is incredible, as going back and driving other Subarus makes me wince now. It's really that good. As the only real good replacement for the shifter, this assembly does a very good job making the experience of driving more enjoyable. It's a bit pricey, yes, but it is quality.